We are fascinated with this genus of plants native to Australia. The vast majority of the nearly 400 species are shrubs which are what we grow. Australia is a big country but the areas that receive truly cold weather are restricted to the highest mountains and alpine valleys. 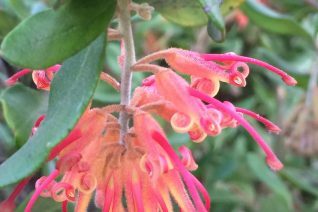 Not surprisingly species from the highest elevations of the Australian alps have proven to be fantastic garden plants in our climate- and there are many more species and cultivars waiting to be tested here. 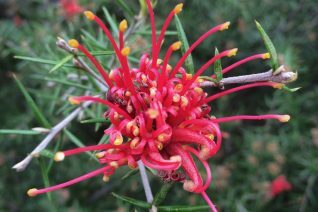 Grevilleas are members of the Proteaceae. That family which is ancient is almost exclusively from the southern hemisphere. Proteaceaous plants have several peculiarities that are important to understand to succeed with them. The soils they are adapted to are universally old and poor and to thrive in those conditions they even form what are called Proteoid roots. These are fine, fine, clusters of roots that can extract the most microscopic nutrients from depleted soils. This has made them very sensitive to overly enriched soils and the substance phosphorus is particularly toxic. Avoid all fertilizers. So, what they require to thrive- and we’ve grown them in this climate for more than 20 years- is just a whole lot of neglect. Do not enrich the soil, even with compost. Our native unimproved soils are exactly what they require. 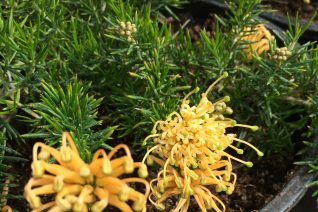 The best way to approach planting a Grevillea (or any Proteaceaous plant) is simply to dig the hole, plant, and water the plant if it gets dry until you see good new growth. Then cease. 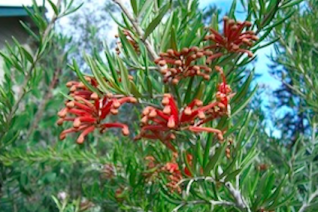 Grevilleas are supremely drought adapted and are best left to subsist on only what falls from the sky. Its important to avoid watering them in hot weather. The combination of wet/hot soil will kill them- almost immediately. Neglect. It works. We love them for their varied textures as well as propensity in our climate to bloom continuously- including all through winter. Give them a slightly protected location such as a south or west facing aspect in as much sun as possible. During the winter I have a permanent “flock” of Hummingbirds who harass my shrubs- one of the few nectar sources in winter- and they know it. If you want hummingbirds this is the number one shrub to plant. Nearly all grow very very fast, even without irrigation and it is advisable to prune them regularly to make sure that underground root growth mass matches top growth. If above ground growth is too rank it can rock the whole plant in gusty weather. Up to 1/3 of the mass of the plant can be removed annually on well established plants. 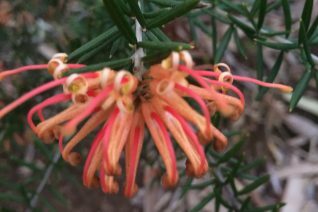 The flowers on cold hardy Grevilleas are uniquely adapted. The flower buds are clad densely in fine hairs which actually insulates them from extreme cold. Open flowers are cold hardy to about 24ºF but masses of protected buds hardier to much lower than that always wait in the wings to be replaced those damaged by frost. So, the floral display is briefly interrupted but quickly resumes with a thaw. Also, if your plant is shy to flower at first, we have found that light tip pruning- just 1/2″ off of each tip will spur them into bloom, increasing blooming wood as well as plant density. This may be done at any time of the year. 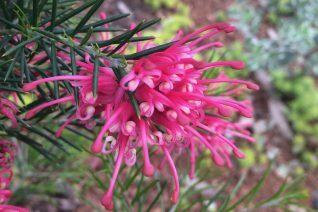 The same cultural requirements can be found for other plants in the Proteaceae- Embothrium, Hakea, Lomatia, and Telopea average, un-ammended soil with NO supplemental fertilizer and compost. 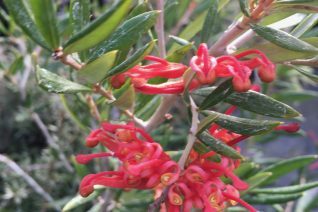 Alpine Grevillea is a cold hardy, handsome adaptable evergreen shrub that is good looking at all times. In late winter/early spring flossy white flowers explode over the bush and emit an intense honey fragrance. Each small leaf is olive/ochre green on the surface and silver below. Dense, fine textured very rounded compact shrub to 4′ tall and 5′ wide in 5 years. Maxes out at that height but continues to gain width. Avoid enriched, over-improved soil. Best in unimproved native or even poor soils with sharp drainage. Little water ever once established. 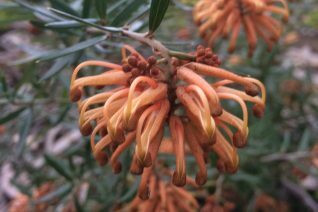 Cold hardiest Grevillea taking temperatures to just near 0ºF with no problem. Tolerates subfreezing wind as well as ice and snow. Easy to grow if left strictly alone. It may be pruned in spring to limit the size- prune tips. Very good landscaping plant. The powerful honey fragrance of the flowers is detectable for quite a distance on warm days. But for this it would make a good cut flower- fragrance is a little too strong. Cut branches last for several weeks in a vase and foliage is handsome. Good deer resistance. Interesting plant for the collector. This is a low and mounding form of the hardiest Grevillea species. The tiny leaves are pointed, not rolled as in the species and they have a uniform tan green hue. In spring- after several years in the ground tiny flossy white flowers swarm the foliage from every leaf axil. They emit a penetrating honey perfume for weeks. VERY VERY slow growing to just 8″ tall and barely 2′ wide after 7 years. Full sun- no shade at all and average to poor well drained soil. It does just fine in native soil that has not been amended and its ultimate preference is for loam. Excellent small evergreen shrub for rock gardens, small spaces. More of a collectors plant. Useful on steep hillsides. Very hardy to cold enduring 5ºF with no issues. Little to no summer water. Moderate deer resistance. Slow. Tasmania, SE Australian Alps. In the wild it cozies up to boulders to absorb radiant heat. This could be repeated easily in a garden. Rare. Limited quantities. About 15 years ago we planted this tiny seedling at the top of our propagation hill behind our wholesale nursery in Sherwood. After all those years and two trips down to 5ºF, numerous ice, snow, wind events it has remained completely happy and unblemished. This is closer to the species in form. To 4′ tall x 6′ wide in 5 years. Very prickly needles pose as the leaves forming a very formidable shrub. From January to July flaming red/orange flowers are curly and lick the tips of the stems like flames. And LOVED by hummers. Full sun to part shade, the very poorest, most well drained soil with no summer water once established. Takes clay soils on slopes. Completely drought adapted and it likes it that way. Great deer resistance. Long season of bloom on a charming architectural evergreen shrub. Low ground cover form of the Juniper Grevillea. Spreading to 6′ wide it rises to just 2′ when happy. Most of the time it is much lower. This selection is the most commonly seen orange form of this species. Spidery orange/red flaming flowers appear in clusters at the branch tips. The most likely bloom period is February-June- but older plants pump out sporadic flowers year round. Excellent on slopes- especially warm south facing slopes in a protected location. Surprisingly cold hardy enduring temperatures down to about 8ºF with no damage. Avoid subfreezing wind as well as boggy conditions and crowding fro other plants. Extremely drought adapted requiring no supplemental water after a year or two. Highly deer resistant. Excellent evergreen- but prickily shrub for Hell strips. Loved by hummingbirds. We have since introduced G. j. ‘Xera Ember’ which is a more compact shrub 2′ x 4′ and has merely deeply hued (bordering on red) flowers for a longer period. Gains hardiness with age. Pictured here with ‘Molonglo’. Juniper leaved Grevillea that is a low spreading ground cover. Grass green needle like foliage plays host and is often obscured by masses of curly apricot yellow flowers. They peak in late spring but occur almost any time of year. Poor, well drained soil in full sun with no supplemental water ever. To 2′ tall by 6′ wide in 5 years. Supremely adapted to the heat and drought of parking strips. Prickly foliage deters animals- and even people. Incredibly floriferous shrub with year round flowers peaking in spring. Loved by hummingbirds. Protect from subfreezing wind. No fertilizer. Dense enough growth to smother weeds Best with total neglect. Loved by hummingbirds. Little water when established. Amazing in bloom. A pretty shrub for a protected location. 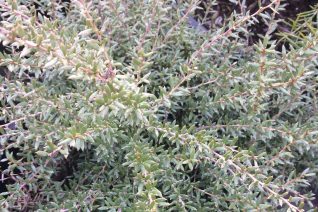 Compact growing evergreen shrub with medium green needle-like foliage. To 2′ x 4′ in 5 years. Nearly year round-but peaking in spring, copious light pink curly flowers are loved by hummers. Protected location in virgin, un-improved soil. Little to no summer irrigation. Excellent on a hot south facing slope- avoid crowding by other plants or an exposed cold site. Its possible that this is a hybrid and not pure G. juniperina. However, there is so much variability in this species that we are unsure. Extremely drought tolerant but it seems to grow faster and bloom more profusely with light water in summer. This plant is great at the Oregon coast where it is in nearly full bloom year round. It has survived undamaged in my garden for 9 years and has endured temperatures to 10ºF undamaged. It could be much hardier (when established). Limited qualities. 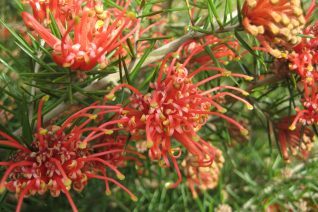 Our improved selection of the Juniper Leaved Grevillea with darker orange to near red profuse flowers and a more compact habit. To 2′ x 4′ wide in time the prickly grass green foliage of this spreading evergreen shrub allows the vivid curly deeply colored flowers to shine. Blooms nearly year round with a peak in mid to late spring. Loved by hummingbirds. Completely drought adapted- never needs supplemental water. Poor to average soil that drains but has never been amended or fertilized. Awesome candidate for a hot hillside or a protected hot south facing wall. Spectacular in bloom. Requests neglect- you should oblige. Hardy to around 7ºF. Full sun. High deer resistance. 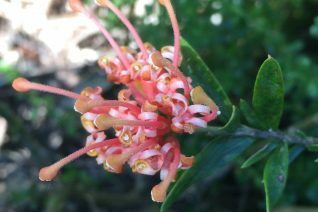 Round leaf Grevillea is a great cold hardy species from the highest elevations in the mountains of SE Australia. Handsome wavy round evergreen leaves frame showy pendant flower clusters from January to June. The sunset colored flowers feature orange/yellow/pink in various incarnations depending on the temperatures. Loved by over wintering Anna’s hummingbirds. Any reasonably well drained soil that has NOT been amended. Native soils are perfect, and tolerant of clay as well as sand. Great on slopes. Fast, large growing to 8′ x 8′ in 6 years. Little summer water required. Sporadic flowers appear year round. Avoid fertilizers. One of the best climate adapted Grevilleas that we have grown. Grows very fast with little water. Full sun and a hot position. Listed as endangered/threatened in Australia where it occupies just a half dozen sites in the high mountains. Extra reason to grow this fabulous multidimensional shrub that is good looking year round and blooms for a long, long period. No summer H20 when established. None. Surprisingly cold hardy and wonderful Grevillea that is threatened in the wild. Crinkly, prickily, finely divided leaves create a haze of a frame to 5′ x 6′ in 6 years. This “cage” of foliage is intermittently decorated with soft purple flowers from spring to early autumn. These are tipped with a bright green style that is released in bloom. The flowers are often described as toothbrush like. Full sun to very light shade in average soil. Light summer water speeds growth but that is the only reason it is necessary. A protected location. Hardy to about 10ºF- and suffering no damage in the wild winter of 2016/17. Protect from subfreezing wind. Easy to grow with neglect and good siting. Same hardiness to cold as ‘Canberra Gem’. Give it room as it will steadily and methodically increase before you know it. Moderate deer resistance. AKA Carrington Falls Grevillea. Avoid fertilizers. If it never bloomed this shrub is fantastic for texture alone. Not for cold gardens- best with some urban protection. Very limited quantities. 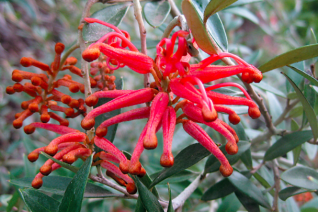 AKA Royal Grevillea. From the high mountains of Australia one of the most handsome and exotic shrubs that will grow in our climate. Fast growing evergreen to 7′ tall and as wide in 5 years- much larger in time. Silvery gray leaves and from September to April rust colored drooping buds that open to showy pendant orange flowers. Flower buds are formed in summer and occasional light summer irrigation will prevent buds from aborting in our hottest spells of weather and a reason to site it carefully. Full sun to part shade in a cool position- an open north exposure. Avoid the reflected heat of walls, asphalt. Excellent performance in cooler areas including the Oregon Coast. Average, well drained soil and NO FERTILIZER, NO COMPOST- virgin soil that is well drained is best. BLOOMS ALL WINTER. Hummingbirds. Excellent performance in colder rural gardens. Tolerates high overhead shade of trees. Silvery handsome shrub- if it is shy to bloom simply tip prune each stem lightly and this will not only cause it to become more dense but encourage flower set as well. Prune in spring AFTER the main flush of blooms has passed- especially if growth has been fast and rank. It may be pruned quite hard to maintain a smaller denser plant. To be honest this plant has at least a few flowers on it year round. 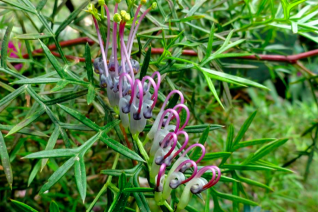 A cold hardy parent of many Grevillea hybrids. Great climate adapted shrub. Water until you see vigorous new growth and then taper off. Avoid watering during the heat of the day. Protected location. One of the easiest Grevilleas to grow in our gardens this free flowering hybrid requires a protected location but is surprisingly hardy when well sited. To 4′ x 6′ wide in 5 years, the needle like foliage is bright green and fairly crowded along the stems. In spring through autumn- and sometimes during mild winters clusters of spidery deep vivid magenta flowers appear all over the plant. Very showy. Loved by hummers. Full sun and average to poor well drained soils. Great at the top of a hillside or next to the south wall of a house. No summer water- ever, or compost. Native unimproved soils are what it loves. Cold hardy to the low teens. It has recovered from lower and we’ve seen established shrubs in protected places all over western Oregon. Fantastic performance at the Oregon Coast where it should become a staple landscape shrub. High deer resistance- and that includes Elk on the coast. Takes well to pruning after the first flush of bloom has ended. Hybrid between G. rosmarinifolia and G. juniperina. Evergreen. This is an important hybrid that is among the best known in the United States of G. victorae x G. juniperina. A wiry rounded shrub with thin twisted green leaves that are rolled at the margins. Throughout the year a constant procession of orange/red flowers decks the whole frame. Loved by hummingbirds. To 7′ x 7′ in 7 years in average, well drained soil in full sun with little water once established. 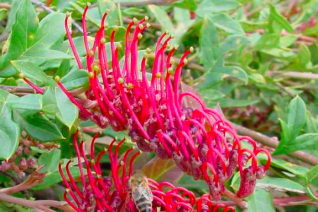 Not the hardiest Grevillea and has been superseded by cold hardier and superior varieties- such as ‘Neil Bell’. 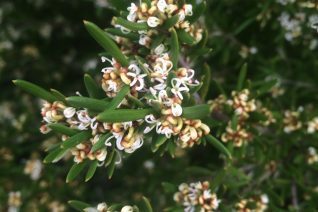 It is, however, an excellent evergreen shrub for the milder coastal regions. In Portland it is relegated to the warmest urban areas in protected locations. Easy fast shrub that you should protect from subfreezing wind inland. There are enormous specimens on the northern Oregon coast that adore that climate and it is naturally adapted to sandy soils. High deer resistance. Loved by hummingbirds. Prune to contain and maintain a compact habit. Hardy to about 13ºF- or slightly less hardy than ‘Canberra Gem’. Very floriferous. Handsome evergreen shrub that displays masses of gold/old gold spidery flowers nearly year round- peaking in late winter into spring. Clean paddle shaped leaves are olive green on top and silver gray on the underside- a great combination with the flower color. Dense growing to 4′ x 6′ in full sun and poor to average well drained soil. Little summer water when established- extraordinarily drought tolerant. Loved by hummingbirds. One of the easiest to grow and fairly spectacular in full winter bloom. Excellent everblooming shrub for slopes, dry hillsides, low water areas. Avoid compost, nutrients. Tip prune if growth is too fast or rank and endangers the plant from rocking. ‘Leanne’ thrives on our own unimproved native soils. Full sun to very light shade and neglect, sweet neglect. Excellent cold hardiness. Hybrid between G. victorae and G. juniperina. Avoid summer water which can leave it susceptible to phytophthera. It can tolerate ANY amount of extreme drought with no problem. Nice mounding habit for hot hell strips. Mixes well with Arctostaphylos, other drought adapted shrubs. Gains cold hardiness with age- establishment. Excellent garden shrub for sweet sweet neglect. 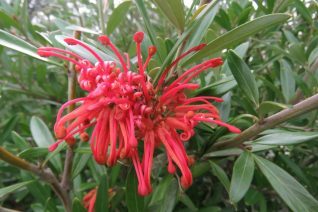 Pretty and very large Grevillea that deserves the mildest parts of the garden. Small gray leaves are handsome and a great backdrop to the hot orange pendant clusters of flowers. Blooms year round with an especially large flush in spring. Loved by overwintering Anna’s Hummingbirds. Not the hardiest Grevillea- protect from subfreezing east wind- site on a south or west facing aspect. To 9′ x 9′ fast. 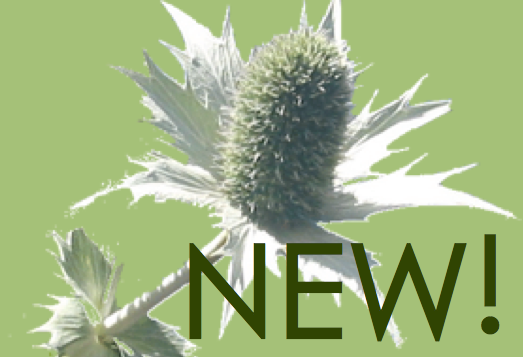 Plant in UNAMENDED native soil- avoid compost and fertilizer. Supremely drought adapted. Avoid watering in summer. Excellent performance at the Oregon coast. Our stock plant which has thrived for 15 years in a very cold place is situated on a slope with the overhead protection of Douglas firs. Evergreen. High deer resistance. 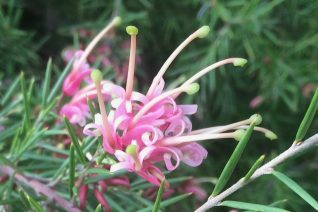 A chance seedling in Neil Bell’s Monmouth, Oregon garden has yielded one of the finest Grevilleas that we can grow. 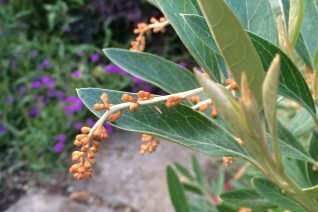 Large evergreen shrub with dapper paddle shaped leaves olive green on top and gray underneath. Year round spidery pendant tomato red flowers appear- waxing and waning with the weather- they favor cooler weather. Fast growing and completely drought adapted. Water to establish then none in subsequent years. Takes well to tip pruning. Well drained average to poor soils that have NOT been improved. Adaptable to clay especially on slopes. Loved by hummingbirds and predominantly staked out in winter by Anna’s who recognize it as a superior food source. It has been cold hardy to 5ºF planted in the ground suffering no damage. 8′ x 8′. 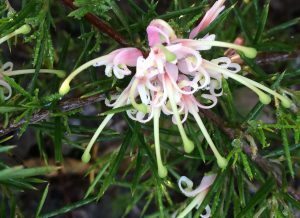 Cold adapted Grevilleas have flower buds insulated with fine fine hairs- this protects them from the coldest temperatures. Open flowers may be damaged by lows colder than 23ºF but new, protected flower buds will open in the next thaw so the display resumes quickly. Prune in early summer- this produces a denser shrub and will spur it to into bloom. 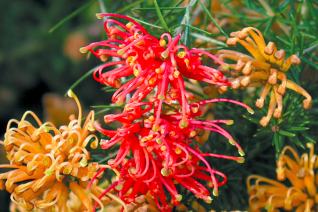 Grevilleas may have as much as 1/3 of their mass removed annually and will regrow rapidly. This can be useful for shrubs that have grown too fast or rank and need to be stabilized by resizing. Do not water during very hot weather- it is adapted to the most desiccating heat and dry with no ill effects. Fantastic shrub. Protected location. Flower buds do not abort in hot dry weather. This seedling showed up in my garden about 6 years ago. It must have been from ‘Constance’ which froze out but this seedling remained. Curious shrub with congested deep green small leaves lining long arching branches. Shows little interest in branching on its own- you can fix this with a few snips of the terminal ends of the branches. I was amazed to find the peach/pink flowers that arrived one spring. Orange on the outside the perianth reflexes when open to pink and peach. Its parent plant had flowers of dark orange/red so this was a surprise. It blooms heavily with clusters of small curly flowers, the perianth reflexes and reveals a long style that is actually light brown. Curious shrub for the collector. Its been hardy below 10ºF in 2013 and since then has never shown cold damage . Full sun and average to poor well drained soil. Little to no summer water when established. The arching stems reminded me of an Octopus. Hence the name. To 4′ x 4′ at a moderate clip. 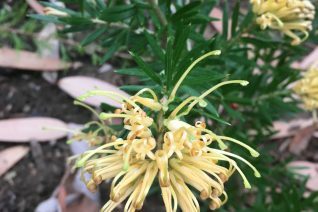 Cold hardy large evergreen hybrid Grevillea with fine needle-like foliage and a nearly constant parade of soft citrus orange spidery flowers. The perianth is soft orange and the protruding style is red. No matter the weather this carefree shrub seems to be in bloom. Heaviest flowering is in mid-winter just when the gardener needs it most. Large spreading shrub to 8′ x 8′ in poor, well drained native soil. Little to no summer water when established. Very very cold hardy enduring 5ºF with no damage. Give it room to spread as it can grow very fast. Takes light overhead shade if not too dense. Incredibly drought tolerant. Very difficult to propagate but we are always trying to make as much of this awesome shrub as possible. The intensity of the flower color shifts with the seasons gaining vividness with cooler temps. Wonderful winter blooming shrub. Grevillea victorae x Grevillea juniperina. A Xera favorite. I selected this seedling because it is smaller growing but with relatively large VIVID orange flowers. To 4′ x 4′ in 6 years. Wavy curved leaves are olive green with a white underside. Blooms nearly year round once established. This selection requires a protected location in inland western Oregon but it absolutely thrives and loves the Oregon coast. Full sun and well drained soil with good air circulation. Water to establish then none required, very, very drought tolerant. An absolute magnet for hummingbirds and over wintering Anna’s find it a special treat. Do not amend the soil, native unimproved soils are ideal. For heavier soils plant on a slope. Established plants may have 1/3 of their mass removed following a blooming session. This will not only make a denser plant, it will also spur it to bloom even more. Moderately deer resistant. All hail DAVID BOWIE! Excellent introduction from Desert Northwest Nursery in Sequim, WA. This seedling of ‘Leanne’ exceeds that cultivar in several ways. First, its a decidedly smaller shrub with tiny, needle like deep green foliage. Second, its profuse flowers are a brighter and lighter yellow that is showy from a distance and great contrast with the foliage. This brand new plant is likely to reach 3′ x 4′ in 8 years. Moderately slow growing. Blooms appear YEAR ROUND and are a beacon to hummingbirds as well as gardeners in the dead of winter. Full sun to very light shade in average, un-amended native soils. Good drainage is helpful. Very little to no water once established. Extremely drought adapted. Beautiful, free blooming shrub that has great promise. Thanks, Ian. High deer resistance. Impressive ground cover Grevillea that can be difficult to locate. To less than one foot tall it spreads out laterally easily 8′ wide in 7 years. The distinctly oak shaped leaves on this shrub emerge deep red before settling to green. All the while it is producing red upward facing “toothbrush” shaped flowers. These appear from February to August primarily but can pop off occasionally year round. All together it forms an amazing ground cover shrub that features fantastic foliage and flowers in a bold tapestry display. Cold hardy to a bit less than 10ºF- it appreciates successively colder frosts to harden off for its ultimate frost resistance. Full sun to part shade in average, well drained soil. Light summer water increases the growth rate- and it can zoom once established. Avoid crowding from other plants- it seems to require good air circulation. Excellent performance on gravel mulch. Large rock garden plant or hot slope cover. Protect young plants from temperatures below 15ºF- it can burn the foliage. Hardiness increases with establishment. The very short trunk emerging from the ground can be surprisingly stout- several inches in diameter. Cover with frost cloth- held down for wind protection during extreme arctic events. Drought adapted when established. A protected location. One of the coolest shrubs we can grow. A naturally occurring hybrid from the Blue Mountains. Excellent around and over boulders which add radiant heat during extreme cold. Should only be attempted in the mildest gardens.